The Facebook wall of Syed Ali Geelani, a leading political figure in Kashmir, has been deleted for sharing a photo of Burhan Wani because it didn’t meet FB’s community standards. Of course the attempt to erase Burhan’s image & memory assures he will be immortalized as a freedom fighter. Loath am I to be a nag–& not for the first time in my life over a political imperative–but the petition against FB censorship is moving too damn slow. For those of us perched on the edge of lockout, that is an issue. Those circulating the petition have thousands of FB friends between us who are not responding to the issue of free speech. The petition isn’t a delusional gimmick to end the occupation of Kashmir. It’s a necessary appeal to FB to respect the US Bill of Rights because the Israeli lawsuit against FB is demanding greater censorship of posts supporting Palestinians & BDS. You don’t have to like the people who initiated the petition or those cited whose accounts were closed. The issue is way beyond personalities & personal antipathies. It’s about freedom of speech. So for heaven’s sakes, sign the damn thing. 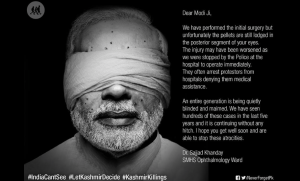 There is a brilliant campaign on social media against India’s use of pellet munitions in Kashmir which uses celebrity images to drive home the barbarism. This one is of course Narendra Modi, the despicable prime minister of India. Will FB allow it to be uncensored? 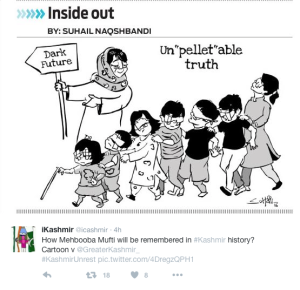 Is India targeting Kashmiri children with pellet guns? There will be an accounting of the numbers permanently injured & blinded by pellet munitions in Kashmir. It will likely show that the many children injured are not accidental or just caught between protesters & the Indian army but are an intentional policy of disabling youth exactly as Israel used in Gaza when it hunted down children with bombers in 2014. Part of that policy is to inflict maximum psychological & physical damage on children to demoralize & terrify them against Intifada. India has likely been tutored in these policies by Israel which has long-term contracts for training military forces in Kashmir. Stand with Kashmiri Intifada. Demand India end the occupation. It cannot be said Amnesty International has taxed its resources to denounce human rights crimes in Kashmir. 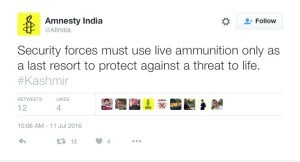 But its Indian chapter Amnesty India is actually endorsing the occupation & use of live ammunition against unarmed protesters. If Amnesty International has any good sense left–& that is not apparent from its shameful reporting on Israeli human rights crimes in Gaza–they will toss Amnesty India out of the organization. It’s not as if they’ll risk donations for such criminal compromises with the barbarisms of the Indian army since Modi is certainly making up for lost revenues in substantial hush monies. But the reputation of Amnesty will be shot to hell. And it’s hanging by a thread now. Saw a posting on Twitter saluting the doctors of Kashmir “who are working tirelessly beyond their shifts to treat the injured.” May we also include other medical personnel & the ambulance medics & drivers being assaulted & vandalized as they carry the injured to hospital. Fifty such assaults have been recorded. Who can also forget the medical personnel who served so selflessly in Gaza during the 2014 siege when ambulances were also attacked & hospitals bombed by Israel? Or those serving the war zones of Yemen, Syria, & Iraq & the refugee camps in Greece & elsewhere? Or those in the Arab uprisings, particularly in Bahrain where they were prosecuted & jailed for treating injured protesters? Or those who at their own risk treated the Ebola outbreak in West Africa? Medicine, at least in the US, has become tainted as elite, money-grubbing careerism so it is an honor to salute those who live its mission to heal & bring solace to the injured & dying. 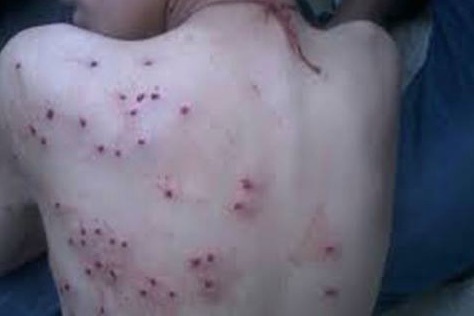 Pellet gun injuries on children in Kashmir: an indictment. Documentation for human rights crimes. 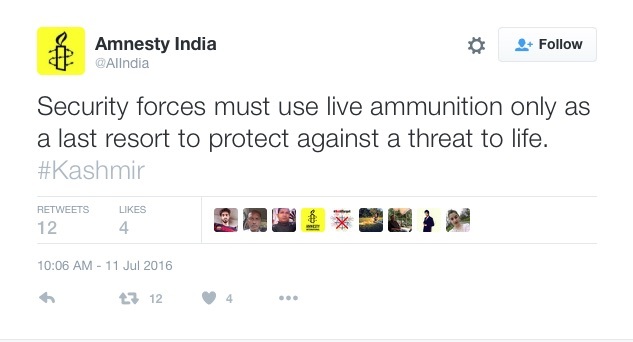 Will Amnesty India demand the Indian army be held accountable? Or is indignation reserved only for those who resist the occupation? Someone recently compared me to one of the great women figures of socialism who was murdered by the German government. I have no such pretensions to glory. I’m an activist & writer committed to human rights & justice as tens of thousands of others around the world. But I am not on the front lines of struggle against oppression as Palestinians, Kashmiris, Dalits & Adivasi in India, the US Black community, & Rohingya in Myanmar, refugees & immigrants around the world. It is from those struggles that the great revolutionary figures of today will emerge. It’s just the case that white men write the histories that get published & assume all the glory but the oppressed have always produced great leaders, thinkers, & activists. Part of struggle is to retrieve & learn from the histories they have made. 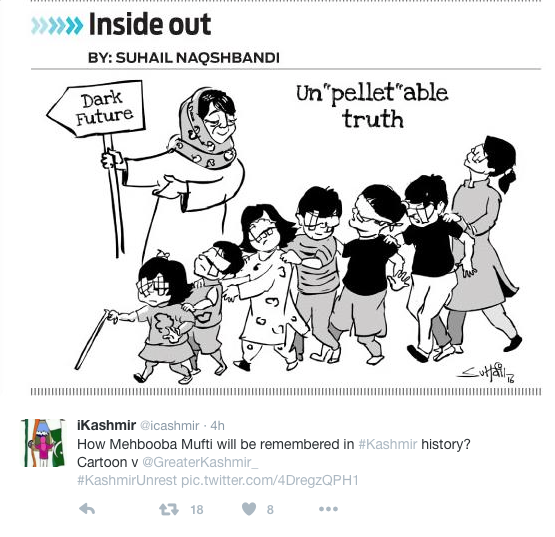 Greater Kashmir has tweeted this article about the role of Rollie Mukherjee’s art in exposing the occupation. We could not be prouder of her & managed honorable mention for posting her powerful work showing the important role of art in giving voice to oppression.